Actor Mayim Bialik attends the 2018 Breakthrough Prize at NASA Ames Research Center on December 3, 2017 in Mountain View, California. 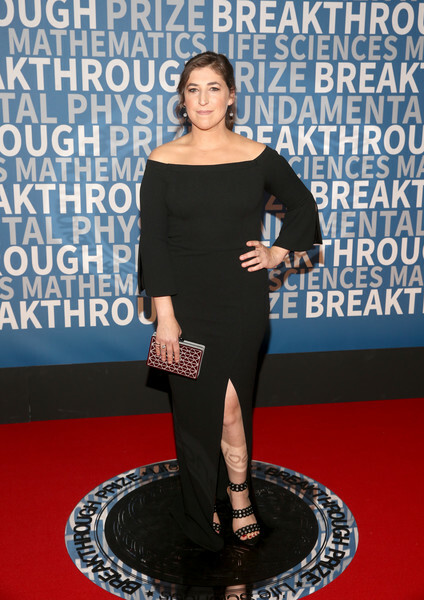 Mayim Bialik kept it simple and classic in a black off-the-shoulder column dress by Allen Schwartz at the 2018 Breakthrough Prize. Mayim Bialik went for an edgy-glam finish with a pair of grommeted strappy sandals by Report. Mayim Bialik pulled her look together with a metallic box clutch by Vince Camuto.